This is a rather healthy dish…loaded with herbs and vegetables and with very minimum amount of meat (if dry prawns are not used).. 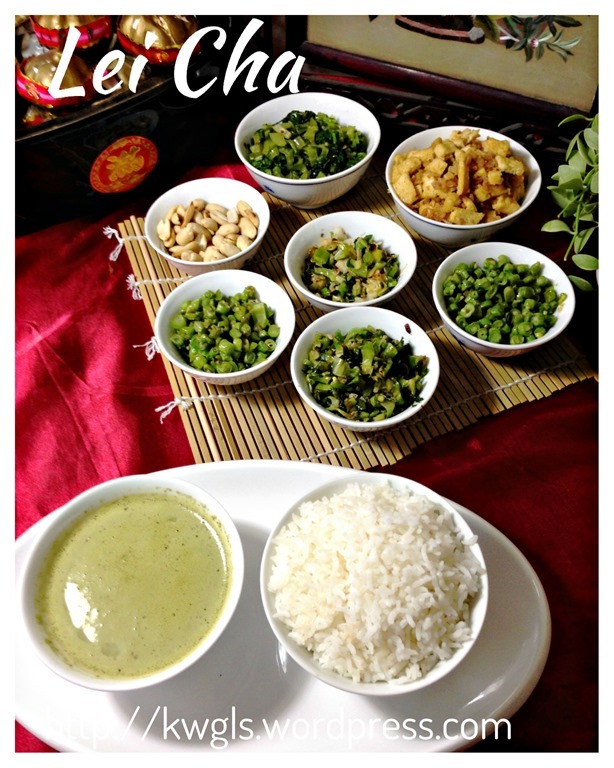 It can be easily transform into a pure vegetarian dish if you do not use garlics and dry prawns. 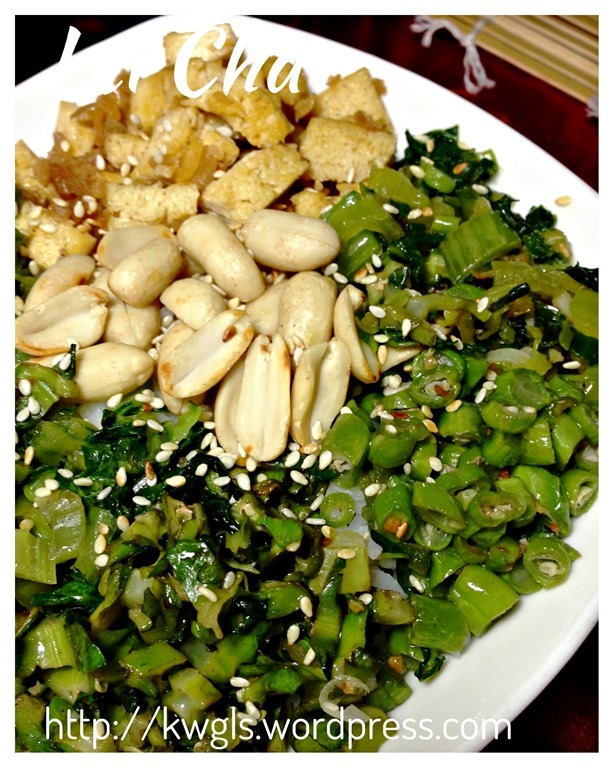 This dish can be even healthier if you do not stir fry the vegetables with oil, instead water blanch all the vegetables….Of course, this method will lack the fragrant of sautéed garlic and shallots. 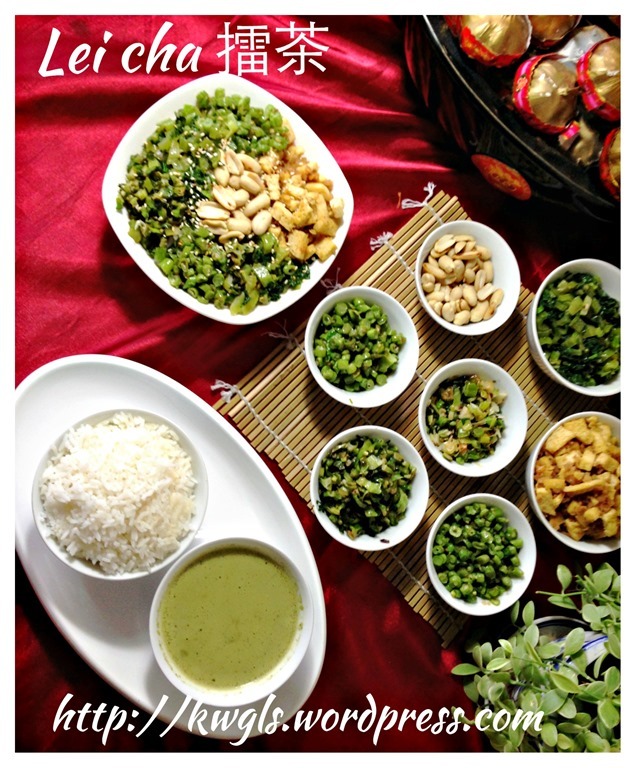 Lei Cha is a bowl of hot steaming rice, topped with various vegetables, nuts and served with a bowl of slightly salty soup made of peanuts, herbs and green teas. It was rather common nowadays in Singapore and Malaysia eating outlets especially in the Hakka restaurants. 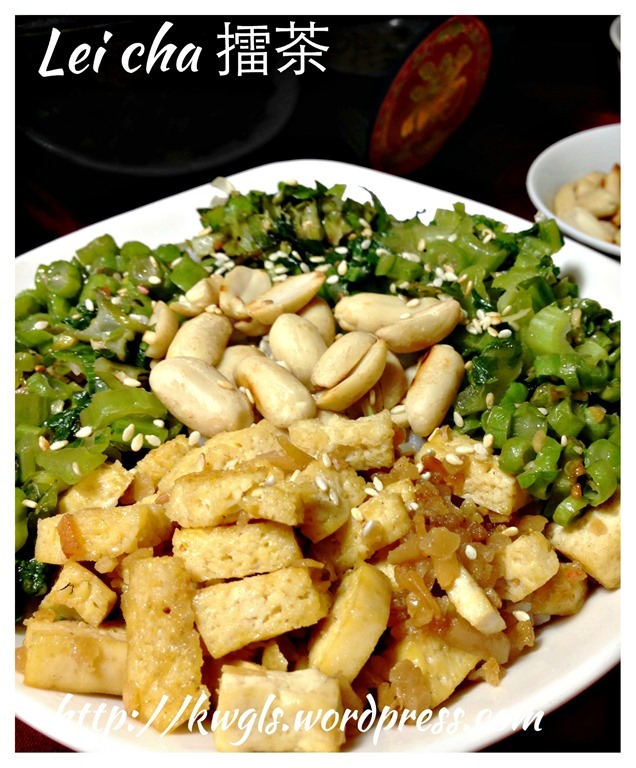 Traditionally, this dish was prepared in the household of Taipu (大浦）Hakka dialects.. The taste of this dish is an acquired taste. Either you like it or hate it. It is slightly bitter and sweet (甘甜）. The bitterness stems from the herbs mix and the tea used.. The bitterness will “subside” after you take the second or third spoon of the soup.. 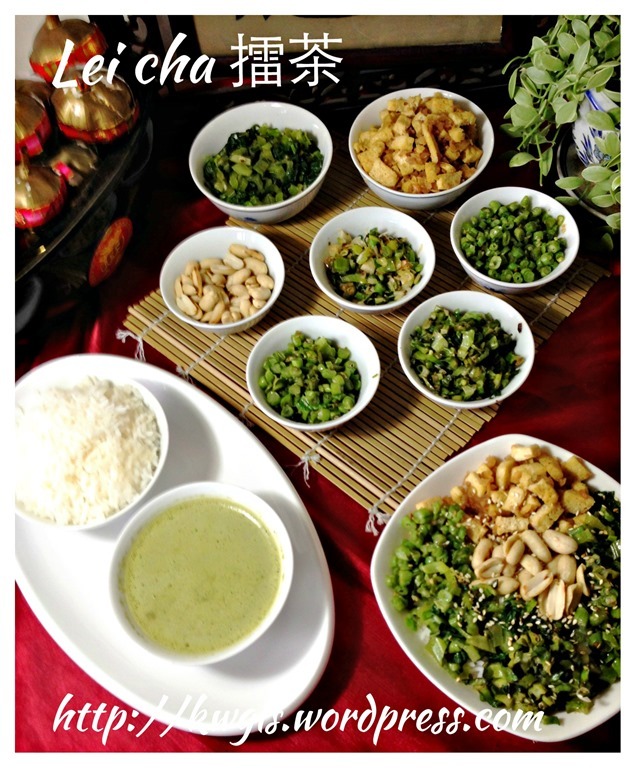 The word Lei Cha (擂茶） means grounding of tea.. Lei is an action of grinding and pounding of tea. Peanuts and sesame seeds are pounded and ground together with the herbs in a wooden mortar until very fine. However, in current year, most recipes have used food processor and blender for the job. 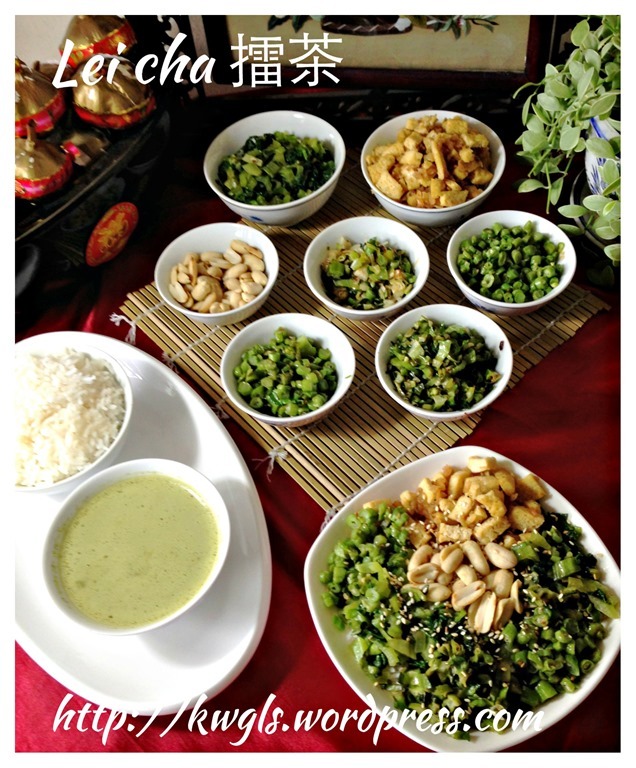 Lei Cha shall be translated as “Pounded Tea” instead of “Thunder Tea” since the word Lei (擂）is an pounding action and different from the word Lei (雷）as for thunder. There are many regional adaption of cooking ingredients and preparation methods and none shall claim that hers or his is the most authentic. 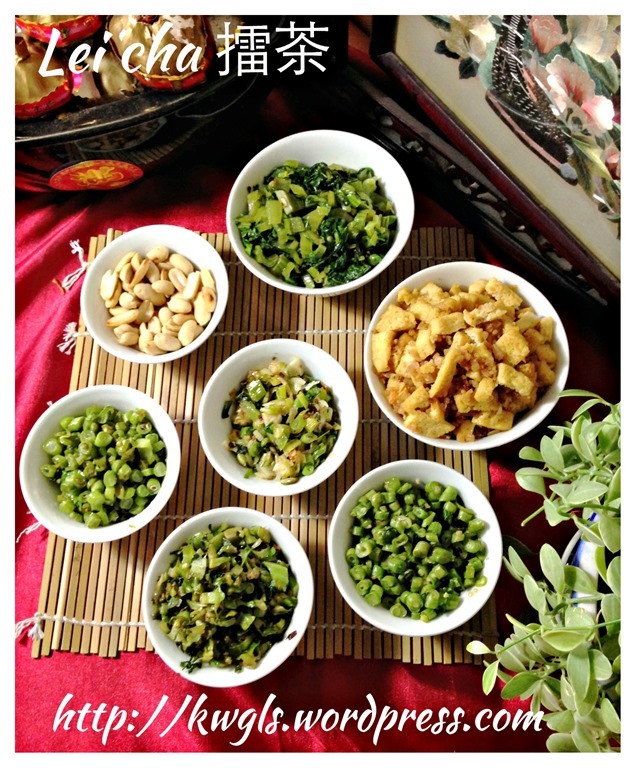 For this illustration, I have purposely prepare 9 dishes (including the herbal soup and white rice) as it is an auspicious number meaning eternality.. 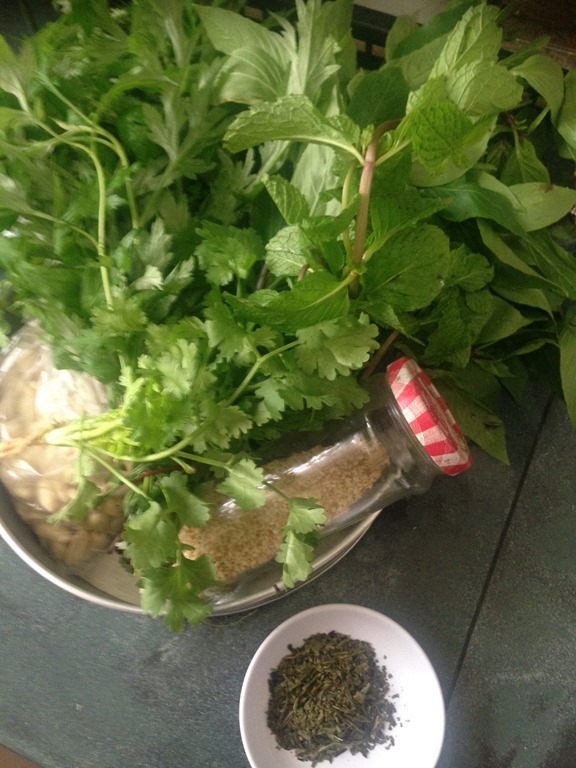 There are many herbs and vegetables stated but most are optional and substitutable except Thai basil, mint leaves, coriander, Chinese Tea, peanuts and sesame seeds. These are few ingredients that give the distinctive taste. Preparation is a bit laborious and I am rather happy that I have successfully prepared it. Feedback from Hakka relatives are that the soup is tasty but is not as fine as what she had prepared using the wooden mortar.. Note: I have prepared 7 dishes but the quantities and type of ingredients are up to individual to decide. Feel free to change to your preferred vegetables that your family likes. As a reference, you can use 100 grams of all the vegetables). 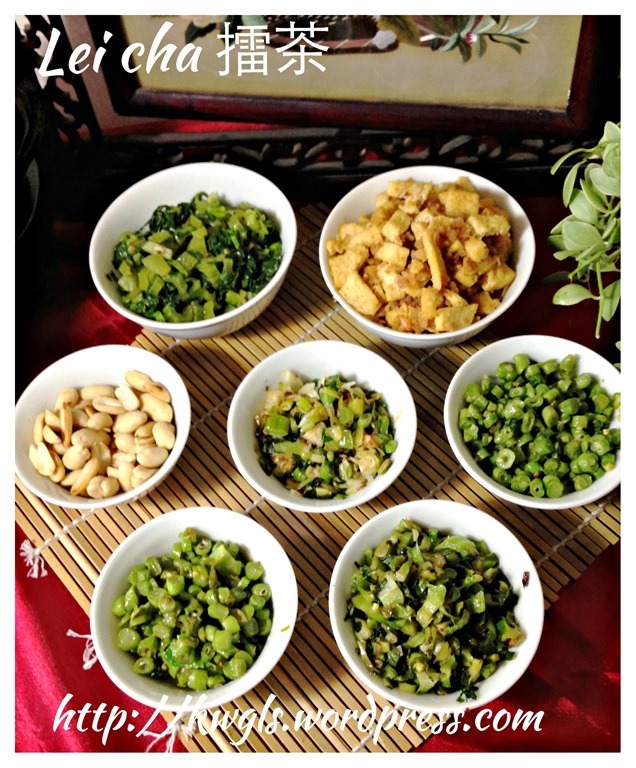 Some recipes uses red beans, anchovies, sayur mani as well. Pluck all the young vegetable leaves, clean and drain. Steep the tea leaves with some hot water. Set aside. 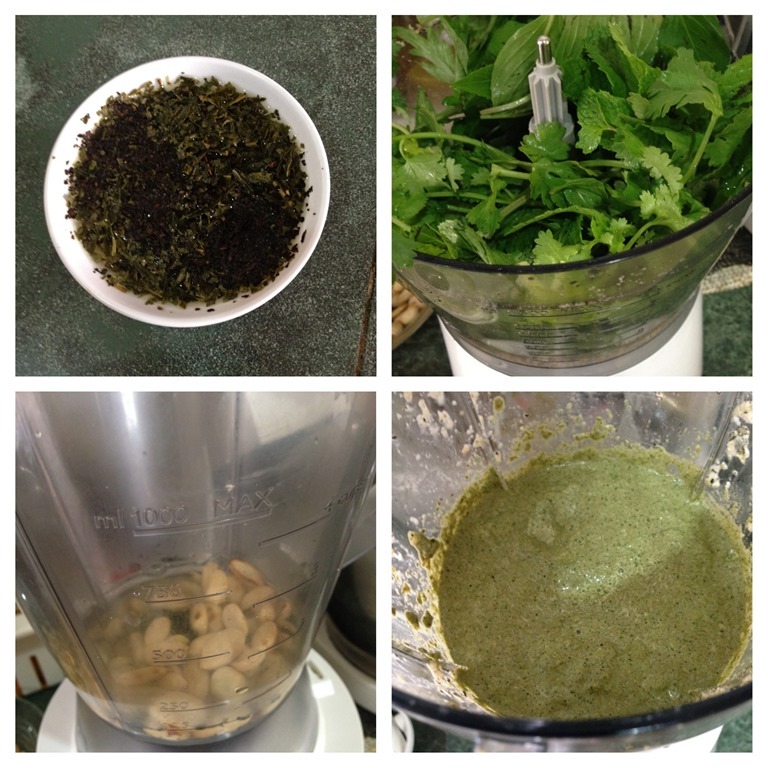 In a food processor, blend all the herbs until as find as you can. In a blender, blend the peanut, sesame seeds and the tea leaves (with the tea) until fine. 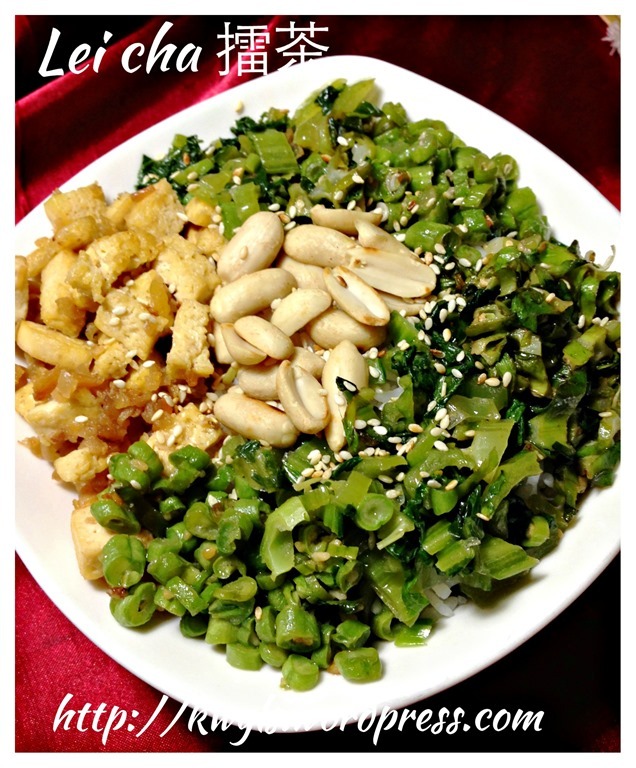 As it is hard to blend the peanut and sesame seeds, some water may be required. Transfer the blended herbs to the blender, add salt, dashes of white pepper and continue to blend until as fine as possible. Add more hot water if you can’t blend it properly. Blend until it resemble a paste. When serving, 1-2 teaspoon of the paste will be put in a bowl and steep with some boiling hot water and it will become the soup to serve with the rice. 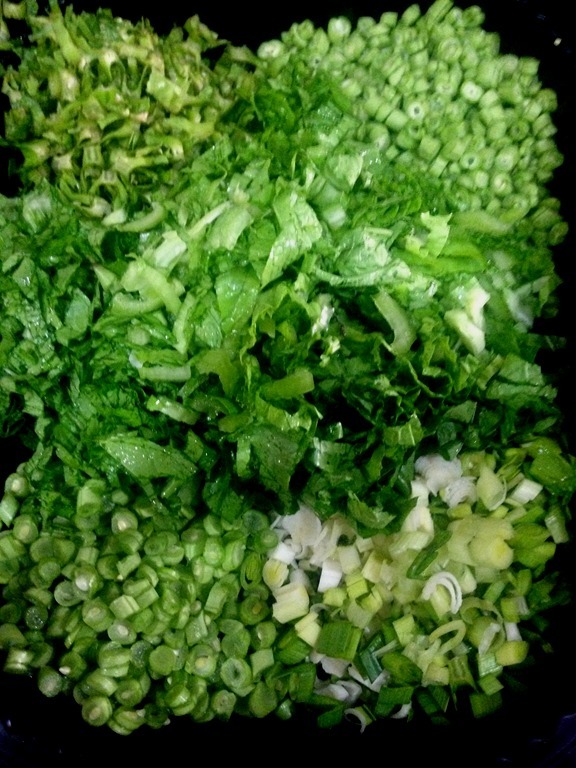 Wash the vegetables and julienne it into small pieces. 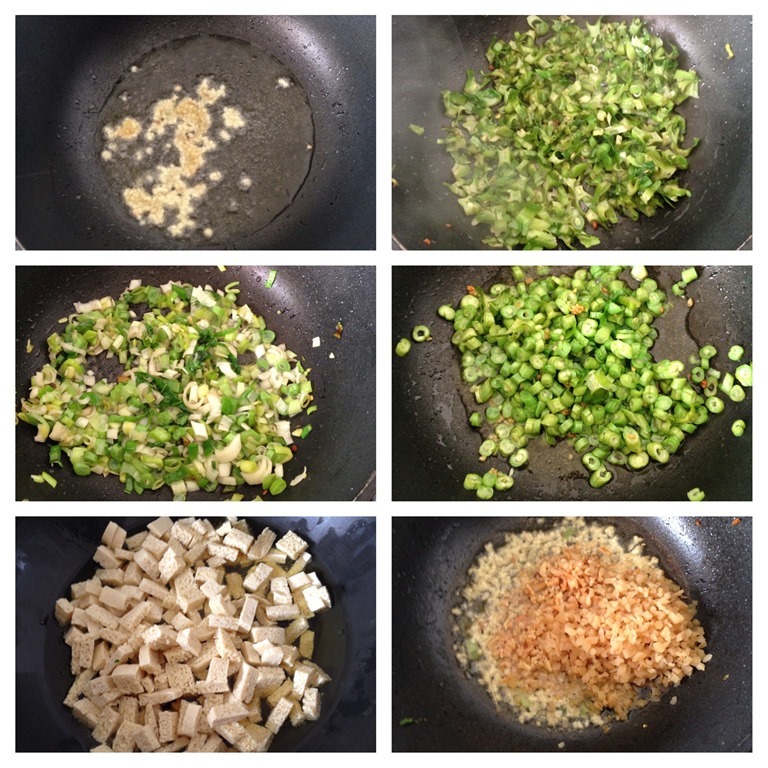 For the vegetables, sauté chopped garlics with some oil, stir fry the vegetables individually. Add your preferred seasonings and salt to taste, Dish up. For the tofu dish, sauté chopped garlics with some oil, add the dry prawns, preserved radish and stir fry until fragrant. 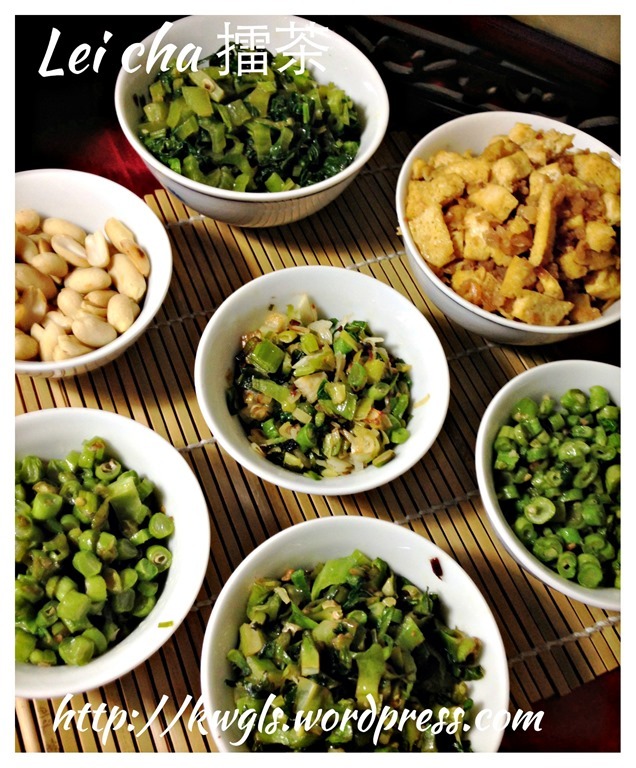 Add the firm bean curd stripes, stir fry until well mixed. Add seasonings (suggested: light soya sauce, white pepper, salt and sugar to taste). Dish up. For assembly, have a bowl of steaming white rice, put a tablespoon of all the vegetables on top the rice, sprinkle with additional peanuts. 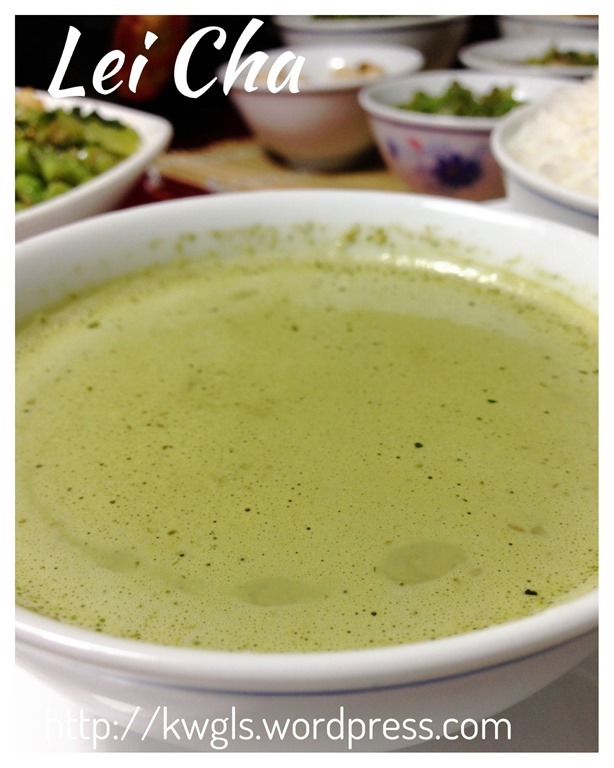 In another bowl, put 2-3 tablespoons of tea paste, steep with hot water to prepare the tea soup. Serve this bowl of rice with the tea soup. 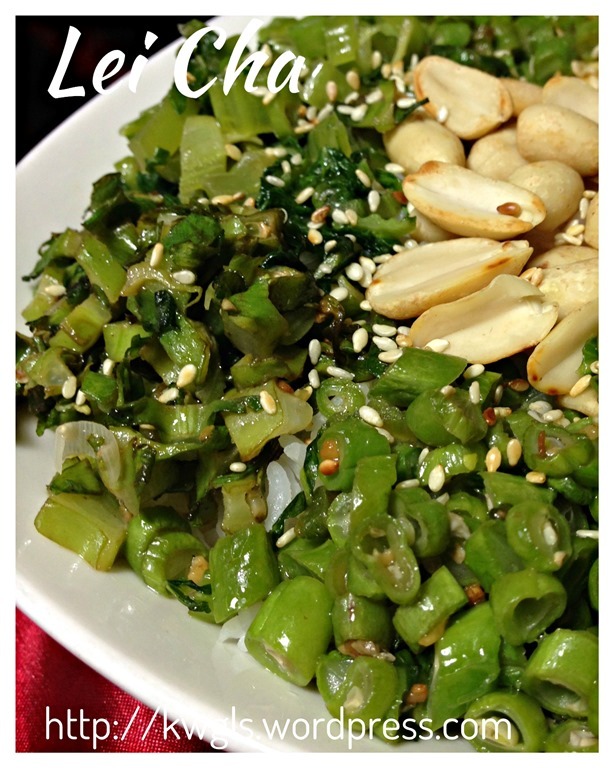 Like many traditional cuisines, every household will claim that theirs is the most authentic. In my humble opinion, none shall claim that theirs is authentic as it is a dish with a long history and with many regional adaptions of methods and cooking ingredients.. Let’s be open minded. Searching of recipes yield many totally different recipes and I will just choose one that will suit my taste buds. 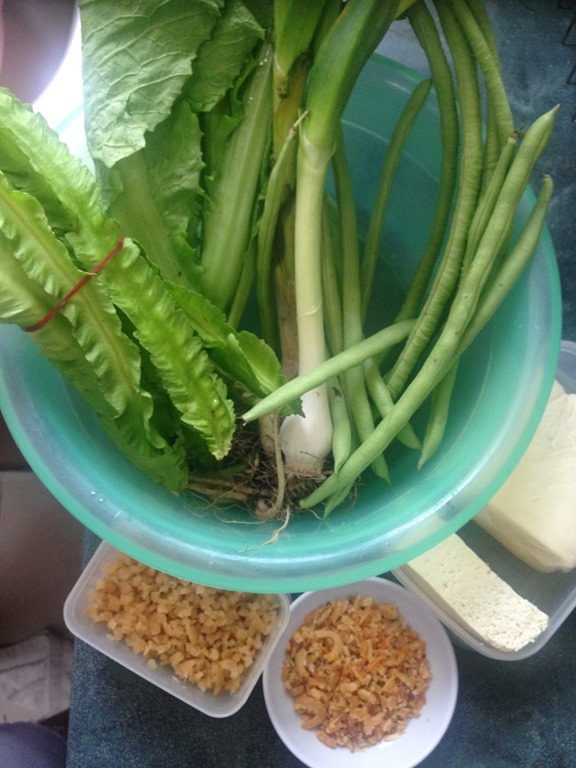 I hope that this post will serve as a starting recipe for readers who have never prepare the dish before.. Have a first trial and amend or adjust the ingredients in your second trial to suit your family’s taste buds. Remember only the few critical ingredients that was mentioned above and I would strongly advise not to omit it. 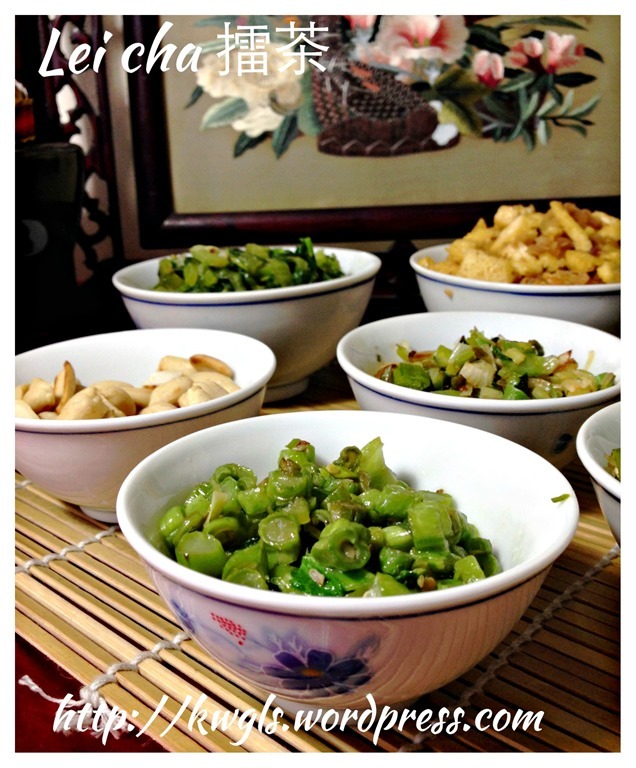 This entry was posted in Dish, Food Preparation Series, Noodles, Rice and Others and tagged 8, grounded tea, GUAI SHU SHU, Guaishushu, hAKKA TEA RICE, kenneth goh, lei cha, lui cha, postaday, thunder tea, 擂茶. Bookmark the permalink. 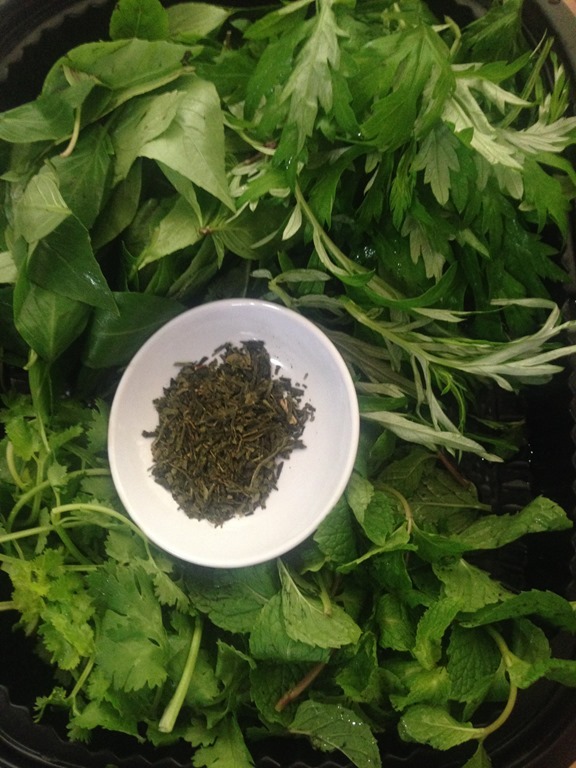 what type of tea leaves did you use?